Well, the proverbial cat is out of the bag. Months have I slaved in secrecy, awaiting the moment to unveil my latest hair-brained scheme, and what should happen? It accidentally gets unveiled elsewhere before I got to tell you! So, slightly before I am truly ready, I will share my long-kept secret! 2013 is the first year since 1987 to have four different numbers! What’s that? You need Something Chocolate? Well of course you do! It’s Wednesday! Go get something. I’ll wait. 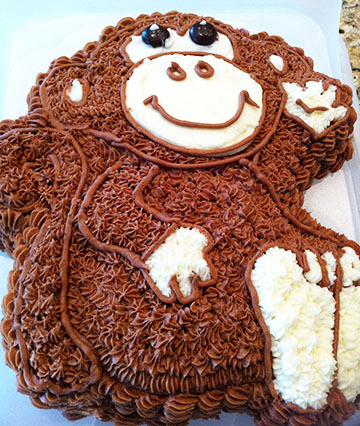 In fact, here, let me offer you some Monkey Cake! Mm mm good and chocolaty!!! Now then, ready for the secret? Last May I thought to myself, you know, self? I think I’d like to write a writing course. I know a little about writing and a little about teaching, and I would like to share with people who would like to learn. So I got to work and, in between other writing and blogging and taking our son to visit every college on the eastern seaboard and westward into Ohio this summer and on into fall… and then winter…, I wrote a course on how to write picture books. I polished and tweaked and roped in some beta testers (who shall not be named to protect the innocent but you all know them :)) I added lessons and took lessons away, turned some lessons into supplements and some supplements into lessons. I reached out to 10 talented artists who very kindly contributed their fabulous work at a fraction of its worth to decorate the lessons and inspire my hopefully someday students. And the result is my little writing course: Making Picture Book Magic! (I wish I could make that sparkle or something! How about we all pretend it’s sparkling? :)) Look! Here’s the awesome header graphic designed by our own fantastic Loni Edwards! Making Picture Book Magic is designed to fit into a busy life-style and be fun, friendly, and affordable. Each lesson will be delivered in a manageable-sized piece by email. I did not reinvent the wheel, but I hope I do have something to offer that isn’t quite like anything else out there. It is my opinion, for what it’s worth :), that it’s helpful to take multiple courses if you can because different people say things and explain things in different ways, and sometimes one way will make more sense to you than another. Different courses stress different things and offer different exercises, resources and experiences. There are lots of great writing courses available – Emma Walton Hamilton’s, Anastasia Suen’s, the Institute Of Children’s Literature’s (which I took many years ago) just to name a few. But I’d like to be able to add mine to the mix in case it’s helpful. And by working hard to make it affordable, I’m hoping it will be an option for lots of people. You will note that there is now a tab in the header above. You may click on it, or HERE, and learn all about the course if you are interested. But in case you aren’t, I won’t go on about it any longer now. It’s time for Would You Read It!!! Today’s pitch comes to us from Wendy. In what seems like a former life, Wendy was a middle school science teacher and principal. Now a writer and mom, she has published several personal essays and articles on parenting and education. When she is not pulling her sons around the backyard on a sled (100 laps on a recent afternoon), she works on her middle grade novel and her blog, The Family That Reads Together. The Pitch: Five seventh graders–a sensitive ballplayer, a new student from Africa, a feared social outcast, a popular cheerleader, and a 9-year-old technical genius–are invited to join a secret time-traveling society. Soon, they must work together to chase an enemy through the bloody battlefields of Gettysburg, an increasingly dystopian Washington, DC, and their own dangerous school hallways. Charlie, Thabo, LV, Adriana, and Caitlin fight against time to restore history, rebuild a country, and survive middle school. Wendy is looking forward to your thoughts on her pitch! And I am looking forward to getting the finishing touches done on my course just in case anyone ever wants to take it! Oh, and if you haven’t signed up yet but you’d still like to, the Free Virtual Conference runs until Saturday the 12th (one more expert was added) so hop over and check it out! So is a crown of chocolate donuts too impractical? I'm so glad you are offering a PB writing course, Susanna! I think you are the perfect instructor for the job:) I can't wait to check it out. However, I've totally over-committed myself this new year but am glad to know it's a monthly offering. I will be back at some point later in the year to enroll. As for the Pitch – YES – I would read it. I love MG and time travel! Thanks so much, Kim! I'll look forward to having you join us later in the year when you have more time! And thanks so much for your comments for Wendy! Susanna, this is incredible! I'm so impressed! Make sure you post this information on the 12 x 12 Forum under Member Events. That's what it's there for! Thank you! It's great to hear that so many people like time travel! All of a sudden I feel like we are brainstorming a picture book. You ARE good Susanna. Oh Susanna, where do I start? I know, I'll start with Stacey's mouth-watering, chocolate masterpiece. Stacey, you've out done yourself. Simply marvelous! I'm sorry to hear someone let the cat out of the bag. It wasn't me, honest. But now that it is, congratulations on offering a Children's Writing course 🙂 I'm in. I want to thank you so much for asking me to be part of your venture. Loni, your cover art is wonderful! Wendy, I can't offer much help as I don't read fantasy. I would definitely read this! Had me at “secret time travel” – so…. and five diverse kids…. and Gettysburg. Susanna, many congratulations & thanks for putting together what looks like a wonderful course. Look forward to taking it in the spring! YES, I definitely would read Wendy's MG book. Love time travel! Also love how you group restoring history, rebuilding the country & surviving middle school together. I am intrigued, though, about the identity of the person(s) or group(s) that put the group together & wonder whether anyone else would like to see that person/group identified in the pitch. Thank you! Yes, it is a balance trying to figure out what to leave in and what to leave out. Maybe calling the group by name would help. At any rate, I will think on your suggestions and I really appreciate your comment! Thank you so much, Patricia! I'll look forward to having you join the fun in the spring 🙂 And thank you so much for your comment for Wendy – interesting idea about the group! Subject: [susannaleonardhillblog] Re: Susanna Leonard Hill: Would You Read It Wednesday #71 – Civil (MG Fantasy/Adventure) AND A Huge Announcement! Ok. I will keep in mind that you draw the line at chocolate tresses. 🙂 All of a sudden I feel like we are brainstorming a picture book. You ARE good Susanna. WOOOOOOHOOOOOOOOOOOOOOOOO!!!!!!!!!!!!!! I WANT TO JOIN!!!!!!!!!!!!!!!!!!!!!!!!!!!!!! Oh, by the way, I would love to read the book! I love dystopian and time-travel! Congratulations Susanna! I think you are a born teacher and am delighted to see you take this step. Right now I am doing all I can do to keep a balance between writing, 12x12m blogging and my meditative work. I may try it a little later. I love time travel, and would read it. It's so hard to write a pitch and I think it needs tightening. Others have given some great suggestions. Thanks for chiming in, Elaine! It all really sounds great, doesn't it Sue? THanks so much for your comment for Wendy! Wonderful title for your course! Best of luck with it. Thanks for your thoughts! I will definitely keep working on it! I would totally read it, and I like the fact that the characters are so different. I would be interested to see how they interact and work together. As for the course, I have always wanted to know more about the whole “children's books should be in multiples of 8 pages” kind of stuff. I know how to write the poems, but I need to know what the parameters are as far as appealing to publishers. Does your course give those tips about format and such?